Harriett Lucinda Goble (b. 1839) was living with her parents on their large farm in Catawba County in the late 1850s. The life of ease and tranquility had diminished with the onset of the Civil War. The young men were off fighting in the war while the women, children, and old men were left to carry on as best they could. The farms were lying fallow and food was getting harder to come by. Supplies were going to the army and civilians were having a hard time finding what they needed to sustain their families. They had to make do with what they had. Lucinda was no different from any other young woman since the beginning of time. She had dreams of love and romance and the man that she would someday share her life with. Lucinda fell for the charms of a much older neighbor by the name of Jacob B. Hedrick, and she became pregnant. Jacob B. Hedrick was born about 1810. He would have been about 50 when Harriett's child was born. 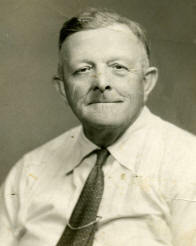 Jacob B. Hedrick was the son of John Hedrick and Louiza Lovi. Jacob was frequently in and out of the area and there were several bastardy cases brought against him through the years. All records indicate that he was a single man and never married. Harriett gave birth to a son on 22 October 1860 and named him Jacob Hedrick after his father. Eventually he went by the name of Jacob Hedrick Goble. About 1865, when Jacob was 5-years-old, Harriett Lucinda Goble married Andrew Jackson Christopher, providing him with a slew of half brothers and sisters. Jack Christopher was born 17 February 1839 and died 21 April 1920. Lucinda had at least ten children according to the 1900 and 1910 Catawba County Census records. Jacob was raised by his grandparents, Lewis Carlan Goble and Evi Hefner Goble. 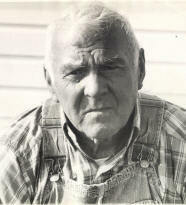 He spent his childhood and youth living at their home, working on the family farm. Jacob was listed on the 1870 Catawba County Census and he was 10-years-old. Jacob was going by the surname "Hedrick" at the time. 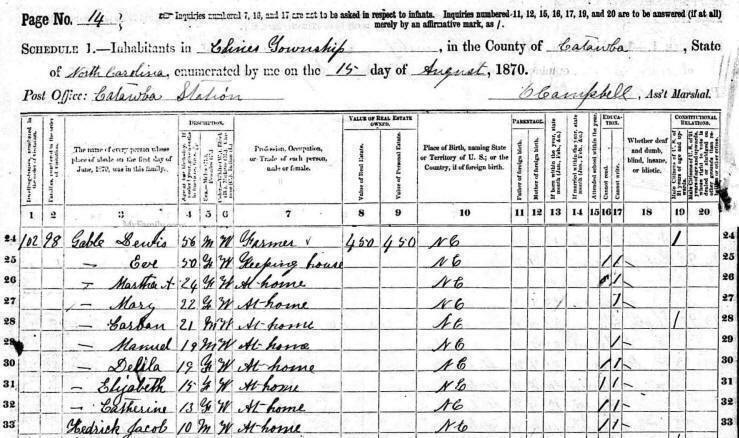 The Census also indicates that he was not snlr able to read or write. 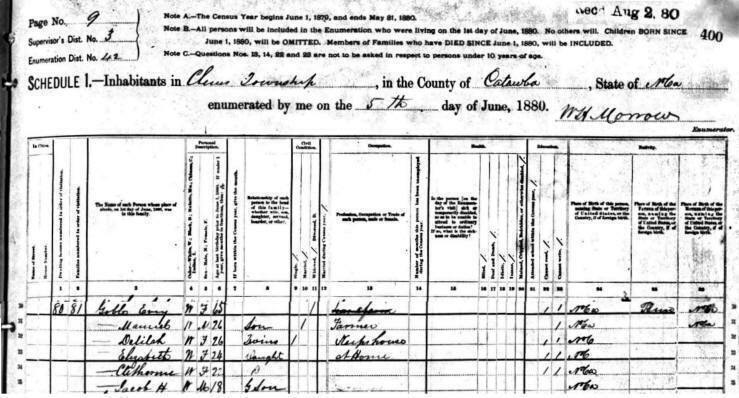 Lewis Carlan Goble died in May 1880, prior to the 1880 Catawba County Census. The Census shows Jacob still living on the Goble family farm in Clines Township, Catawba County, NC. Jacob was 18 and still living with his Grandmother, Aunts & Uncles. His name was listed as Jacob H. Goble and had acquired the ability to read and write. Lewis Carlan Goble left a Will in Catawba County, NC, recorded in Book 2, on Page 224. It was probated in 1880. He named his son Emanuel Goble as Executor of all land. He left his grandson Jacob Hedrick $15. Others mentioned in the Will were: Lucinda Christopher $5, Martha Ann Dagenhardt $5, Mary Magadelena $5, Corban $5, Delila $15, Elizabeth $15, and Catherine $15. Emanuel was to take care of Lewis & Evi as long as they lived, as well as the grandson, Jacob Hedrick Goble, and Delila & Catherine, who were still living at home. 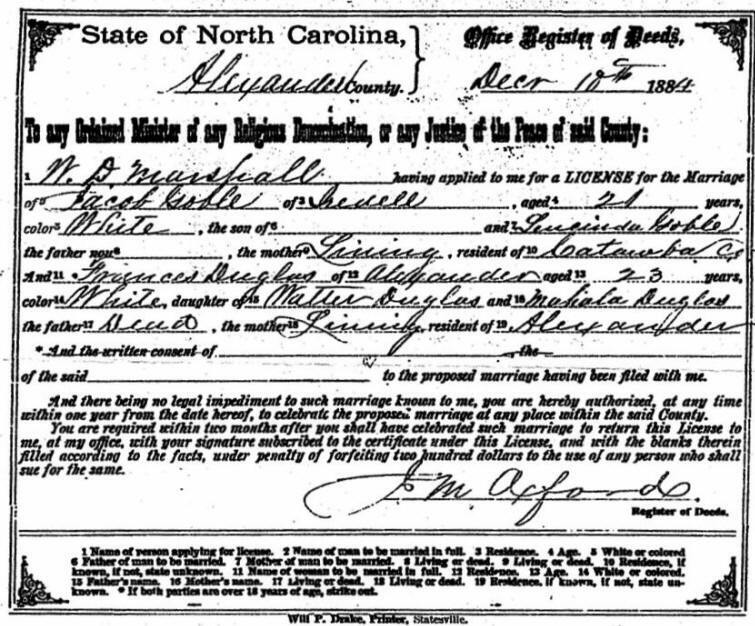 Jacob Goble married Frances Elizabeth Douglas on 10 Dec 1884 at the Haley Douglas House in Miller's Township, Alexander County, North Carolina. Frances Elizabeth Douglas was born on 05 Mar 1861 and was called Fannie by her family and friends. 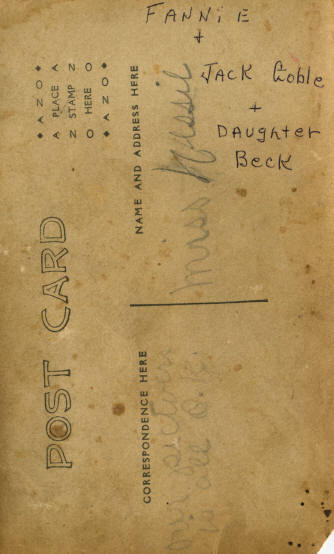 She was the daughter of J. Walton/Walter Douglas and Mahala Catherine Miller. Jacob spent his early years as a farmer. Willie Aleen Goble Loftin, granddaughter of Jacob, says she remembers being told by her Daddy, Martin Luther Goble, that Jacob had also worked in a shoe store. There were numerous times that Jacob Hedrick Goble was mentioned in THE LANDMARK, the Statesville, NC, Newspaper. Jacob Goble, forcible trespass; pleads guilty; judgment suspended. Court was called here this afternoon at 2:30 o'clock, Judge Allen, Presiding, and Solicitor Mott, Prosecuting. Mr. Jacob Lentz is foreman and Jacob Goble officer of the grand jury. Jacob Hedrick Goble and Frances Elizabeth Douglas Goble had at least five children (according to the 1900 Alexander County, NC, Census). The 1900 Alexander County, NC, Census gives the following additional information. The 4 children (Martin Luther, Eliza Jane, Otis Caldwell and Sarah Catherine Rebecca) were living with them as well as Fanny's mother, Mahalia Catherine Miller Douglas. Jacob's birth date was listed as Oct 1850 and his age was listed as 39 initially, but then changed to 49. He was actually born in Oct 1860 and his age was 39. It's been suggested that the above photo is of Fannie and her two children Martin & Eliza Jane. The photo above (Left side) shows the back of the original photo of the family. It says, "Miss Nessie", who would have been Martin Goble's wife (Beulah Vernesta "Nessie" Johnson) - the original owner of this particular photo (and my maternal grandmother). 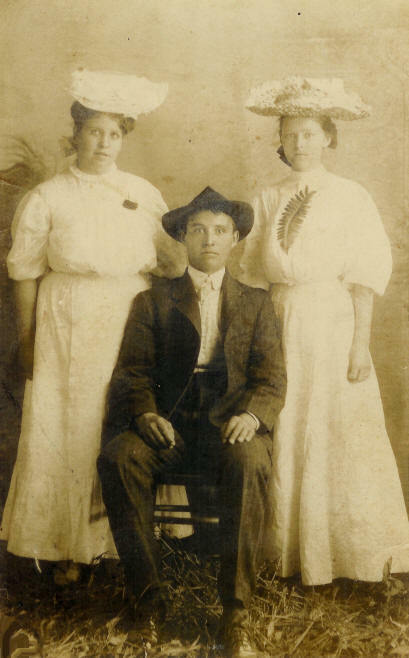 The photo also tells who is in the photo, "Fannie + Jack Goble (Jacob) + Daughter Beck (Sarah Catherine Rebecca "Becky"). Deputy Sheriff James G. Watts and Mr. Jacob Goble carried Mrs. Fox to the State Hospital at Morganton yesterday. A Sunday Tragedy on the Catawba - a Boat Overturns With Five and Two Young Women, Daughters of D. J. Fulbright, of Iredell, and Jacob Goble, of Alexander, Are Drowned - One Body Found Yesterday. Sunday afternoon about 3 o'clock on the Catawba River at Lookout Shoals and near the Iredell-Alexander line, a boat containing two young women, a girl and two young men, overturned. The young women, one a daughter of Mr. David J. Fulbright, of this county, the other the daughter of Mr. Jacob Goble, of Alexander, were drowned. The others escaped. Mr. Fulbright lives in Shiloh Township, near the river and near the Alexander County line. Mr. Goble lives in Alexander County, not far from Mr. Fulbright. Sunday morning five young ladies, Misses Sallie C., Odia and Nora E. Fulbright, all daughters of Mr. Fulbright; Miss Alice Miller, daughter of Mr. Shuford Miller, and Miss Eliza Jane Goble, daughter of Mr. Jacob S. Goble, left home to attend services at Bethel Lutheran Church in Catawba County. Mr. Will Fox took them safely across the river in a canoe. After service they started home and Messrs. Ben Moose and Boyce Johnson, two young men inexperienced in handling a boat, undertook to put them across the river. Misses Odia Fulbright and Alice Miller decided not to risk crossing, the others named got in the boat and started over to the Iredell side. The young men soon lost control of the boat and it was swept down the swift current, over the shoals and into water 15 feet deep, where it was capsized. Misses Sallie Fulbright and Eliza Jane Goble were drowned; Nora Fulbright, about 11 years old, was swept back to the boat by Mr. Moose and clung to it until rescued by parties on the bank. The young men managed to save themselves. Search was made all night for the bodies. Yesterday morning at 9:30 Miss Fulbright's body was found. Miss Goble's remains had not been recovered at 5 o'clock yesterday afternoon. Miss Fulbright will be buried at Sharon Lutheran Church today at 11. If Miss Goble's body is found, it will be buried at Sharon today. Miss Fulbright was 17 years 10 months and 28 days old; Miss Goble was 16 years and 11 days old. Both were members of Sharon Church and young women of fine character. The accident was a most distressing one and there is much sympathy for the bereaved. Mr. Fulbright is a merchant and magistrate of Shiloh Township and is well known in Statesville. The Town Commissioners and mayor have employed Mr. Jacob Goble of Miller's Township, for policeman and he went to work yesterday. The 1910 Census shows Jacob and Fannie still living in Millers Township, Alexander County, NC. Three children are listed on the Census (Martin Luther, Otis Caldwell, Sarah Catherine Rebecca). Eliza Jane had drowned in the Catawba River on the way home from church in 1907. Jacob's age is correctly listed as 49. 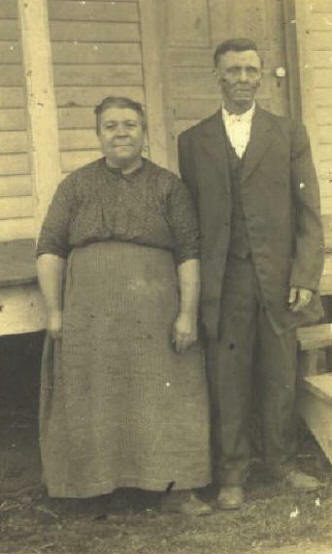 The Goble family also had a servant, Beulah Vernesta "Nessie" Johnson, living with them in 1910. Nessie is listed as having no children, but she actually had two daughters. Genevia May Johnson (from Nessie's first marriage to Charlie Johnson) was living with her maternal Great-Grandmother, Aunt and Uncle. No record has been found where her second daughter, Ethel Irene "Goble", was living. Before the year was out, Nessie married Jacob and Fannie's eldest child Martin Luther Goble. 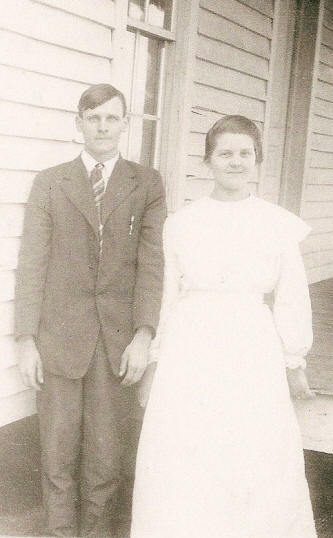 By 1920, Jacob and Fannie had moved the family to Iredell County. 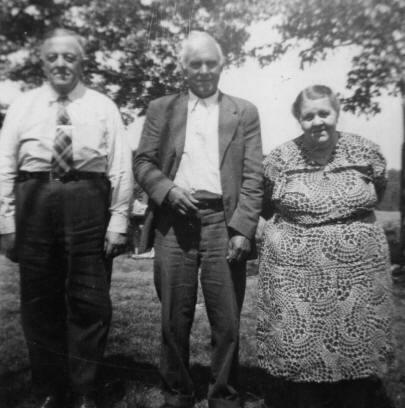 Jacob's age was listed as 59 on the Statesville Township Census and Fannie was 58. 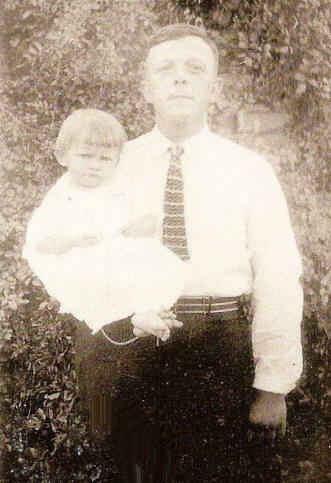 Daughter, Sarah Catherine Rebecca Goble, had married Marvin Bunton on 29 Apr 1917. Rebecca, Marvin, and their son, Ralph Bunton, were living with Jacob and Fannie. Otis Caldwell Goble married Lacy Shoemaker on 21 Jun 1916, but by 1920 they had separated and he was living with his parents and sister. All three of the men were working at a Cotton Mill. Willie Goble Loftin only remembers seeing her grandfather, Jacob H. Goble, one time. As a little girl, she and Helen saw a very dark skinned man approaching the house and her sister, Mary Helen Goble, hollered, “Daddy, here comes a ‘Black Man’ down the road!” It was actually Jacob. Willie was 4 years old at the time and Helen was 5. The family never saw Jacob again. He died 03 March 1929, and one of the twins, Estelene, died 26 March 1929. Jacob lived with his daughter Rebecca Goble Bunton toward the end of his life. On the evening of 02 Mar 1929, Jacob got sick, went to bed and died. He was 68-years-old at the time. Jacob died 03 Mar 1928 at the age of 68 from myocarditis - or inflammation of the heart muscle. 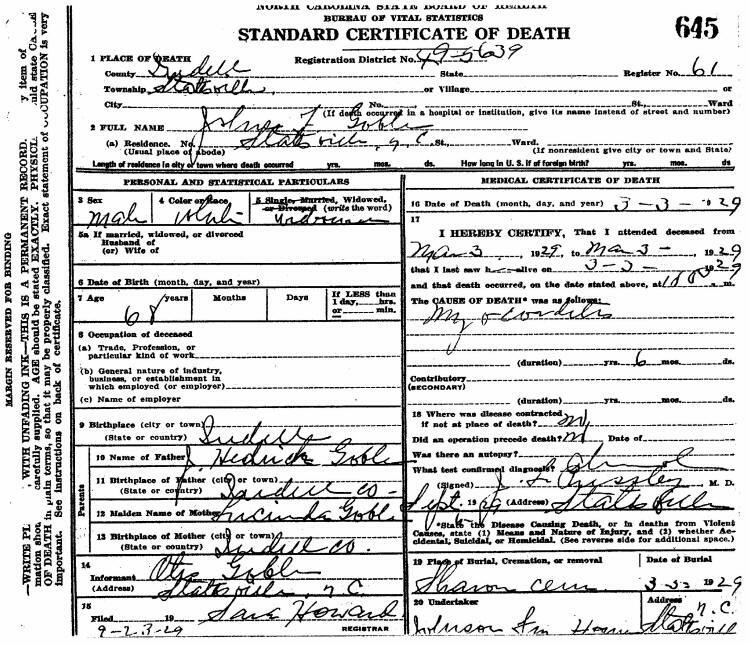 The Death Certificate actually lists his name as "John F. Goble" instead of Jacob Hedrick Goble. His father is incorrectly listed as "J. Hedrick Goble" instead of Jacob B. Hedrick. Lucinda Goble was indeed his mother. Jacob's death notice appeared in THE LANDMARK but incorrectly listed his name as "J. F. Goble" instead of "J. H. Goble". Funeral service and Interment will be at Sharon Lutheran Church tomorrow morning. Mr. J. F. Goble, 68-years-old, died at his home in Bloomfield Sunday night at 10 o’clock. The funeral service and interment will be at Sharon Lutheran Church in the county tomorrow morning at 11 o’clock, the service conducted by Dr. J. D. Kinard. Mr. Goble is survived by two sons, Mr. Martin Goble, of Shiloh township, and Mr. Otis Goble of Statesville, and a daughter, Mrs. Marvin Bunton, of Statesville. Two half brothers, John and George Christopher of Catawba County, survive; and two sisters, Mrs. John Hartsell of Weldon and Mrs. William Witherspoon, of Newton. Fannie died 03 Jul 1926 was buried in the Sharon Lutheran Church Cemetery in Iredell County, NC. Jacob had a headstone placed at her grave. Jacob was also buried in the Sharon Lutheran Church Cemetery but he does not have a grave marker. He is more than likely buried beside of Fannie. Daughter Eliza Jane Goble who drowned while crossing the Catawba River is also buried at Sharon. A gravestone marks her burial site. 1. On the 1870 Catawba County Census he is listed as Jacob Hedrick. 2. On the 1880 Catawba County Census he is listed as Jacob H. Goble. 3. On the 1900 Alexander County Census, he is listed as Jacob Goble. 4. On his marriage license to Frances Elizabeth Douglas, his name is listed as Jacob Goble, age 21. His mother is listed as Lucinda Goble with no father listed. 5. On his son Martin Luther Goble's marriage license, his name is listed as John Goble and wife F.A. Fannie Douglas. On Otis's marriage license the names are listed as Jake and Fanny. 7. 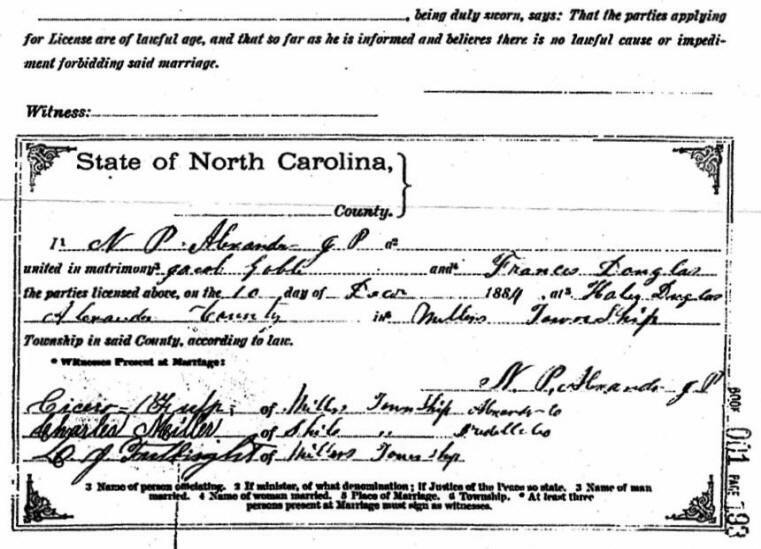 On Frances Elizabeth Douglas Goble's death certificate, her husband's name is listed as Jacob. 8. On Jacob's own death certificate his name is listed as John F. Goble. for the photos of Jacob and his family. If you have additional photos or information about Jacob Goble, please contact me.